With the start of 2019 just around the corner, it is time to put a twist on that classic resolution: new year, new website. Your website is the first impression a potential consumer has, so make it count. Implementing these new web designs trends separates your company from the competitors by establishing a strong online presence and customer appeal. Nowadays, users want to feel special and engaged, so providing a personalized user experience is vital to attracting and retaining customers. Understanding your consumer audience is the first step in this crucial process; from there you can design your website based on the age, gender, and preferences of your visitors. Designing a user-friendly and functional platform also works to improve user experience. Customers tend to return to sites that prioritize fast load time, easy navigation tools, and a satisfying arrangement of content and images. Another popular trend in web design is implementing revolutionary technological advances. Voice user interface “allows people to use voice input to control computers and devices” (from developer.amazon.com https://developer.amazon.com/alexa-skills-kit/vui). This advanced interaction enables users to easily accomplish a variety of tasks, from navigating the web page to finding information, with just the sound of their voice. Augmented reality creates seamless experiences for customers. 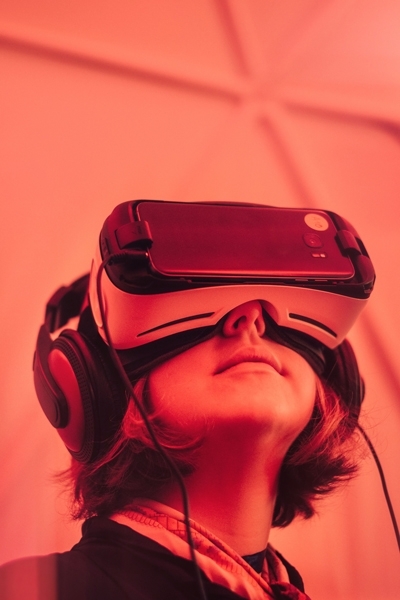 Through virtual tutorials, tours, and even consultations, augmented reality provides an immersive and tangible outlet for companies to drive business value, assist customers, and extend their reach. When developing the content of your company’s web design, minimalism and bold typography provides an aesthetically pleasing effect, which encourages customers to return. This new web design style encourages the use of large letters and bold fonts can give a sort of personality to the product, as well as express the overall tone of the company. Additionally, GIFs and animations add a dynamic and animated element to the website, which increases user engagement. Multimedia elements allow businesses to express information in an exciting and interesting way. Sticky elements, or sticky navigation, is one of the most popular trends in web design. Depicted by the site’s trademark, sticky elements are commonly found at the top, bottom, or sides of the webpage, in order to give the user immediate access to more information or social media links. Additionally, the application of ChatBots is the latest design trend that allows for superior customer service. ChatBots appear automatically and offer assistance to customers by answering questions or providing services. This program allows businesses to offer 24/7 help without extra time or expenses. Progress spectrums provide customers with clearly defined steps during the purchase stage. Each stage is correctly labeled, and tools are available to help guide visitors to the next stage. Compared to long tedious forms, spectrums provide users with a more enjoyable and methodical experience. Lastly, grid layout web designs are becoming popular thanks to the success of pages like Pinterest. Grids provide structure consisting of intersecting horizontal and vertical lines. This layout allows you to keep your content and multimedia elements aligned and presented in an organized way. These new web design trends are taking charge in 2019, so now is the time to revamp your company’s website! You don’t have to make all of these changes — but make sure to identify and feature the best designs for your business. If you have any questions regarding current web design trends or need assistance implementing them, please reach out to info@pinkdogdigital.com or call us at 410.696.3305. Pink Dog Digital can be found on the web at www.pinkdogdigital.com.